Nityanand Jayaraman is an environmental researcher and activist based in Chennai. This is an entry for India’s Minister of State for Prime Minister’s Office Mr. V. Narayanasamy as a record breaker for the largest number of failed predictions on the date of commissioning of the Kudankulam Nuclear Power Plant in Tamil Nadu. 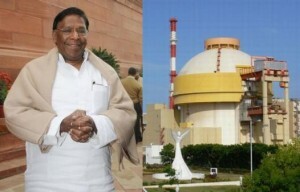 On at least 14 different occasions, Mr. Narayanasamy has predicted the imminent commissioning of the reactor. On all 14 occasions, his predictions did not materialise. Mr. Narayanasamy has continued to make such failed predictions without fear of earning the ridicule of people or the wrath of the judiciary. People protesting against the nuclear plant have referred to Mr. Narayanasamy’s periodic statements as a “weekend-comedy” while the Madras High Court failed to see anything funny in such predictions when the matter was being deliberated in court. Mr. Narayanasamy is the only individual who has the distinction of so many failed prophesies. The Department of Atomic Energy of the Government of India may be the only other contender who comes anywhere close to competing with the Minister. The DAE has been saying from as early as 1962 that nuclear power is India’s future, and that India will have 20,000 MW of nuclear power by 1987. This figure has periodically been reduced, increased and repeated ad nauseum. But as things stand, only 4780 MW of nuclear power has been installed, despite the fact that none of these pre-Fukushima nuclear programs invited any serious resistance from uninformed local people. Narayanasamy seeks blessings of Madurai Meenakshi and Lord Sundareshwarar for smooth commissioning of Kudankulam plant, and removal of all obstacles. Confident that it will be commissioned in 2 months.